activity. AIG Travel Guard http://www.travelguard.com, a leading provider of travel insurance and assistance plans, has launched an adventure travel insurance plan that provides coverage for many activities excluded in most travel plans, including bungee jumping, mountain climbing, skydiving and motorsports. 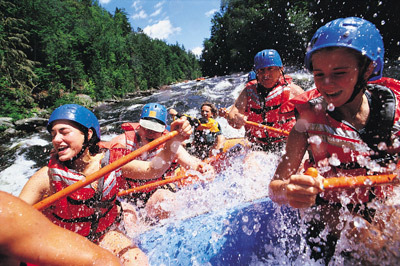 Adventure travel continues to be one of the fastest-growing segments of global tourism. Understanding the unique and rapidly changing interests and perspectives of adventuresome people is critical in serving this growing market. The Adventure Travel Protection Plan offers a range of coverage, including coverage for participation in athletic events, motor sports, mountain climbing, aircraft flying and air travel including sky-diving and hot-air ballooning. The plan also provides a 24/7 Adventure Traveler’s Hotline* which offers weather reports and travel advisories, assistance locating trails and rafting locations, information on access issues, construction and detour information and locations of nearby gear shops, guides and outfitters. The plan also offers optional Cancel for Any Reason coverage and optional Car Rental Collision coverage. AIG Travel Guard has also introduced a series of enhancements to its “Active Suite” of plans — the Adventure Travel Protection, Sportsman’s Travel Protection and Tee, Tour and Travel plans. The enhancements include higher overage limits and new features designed to provide increased coverage to travelers who continue to pursue their favorite activities while on vacation. The complete family of travel insurance and assistance service plans available through AIG Travel Guard can be purchased online at http://www.travelguard.com, through Travel Guard’s 24-hour World Service Center (800-826-1300), or from one of the more than 16,000 travel agencies. AIG Travel Guard is one of America’s leading providers of travel insurance plans for more than 6 million travelers each year. Travel insurance plans through AIG Travel Guard are distributed by more than 12,000 travel agents across the United States. Travel insurance through AIG Travel Guard may include coverage for trip cancellation, travel interruptions and delays, emergency medical expenses, medical evacuation expenses, and lost or delayed baggage. AIG Travel Guard’s plans also include 24-hour travel emergency service* for emergency medical assistance, last-minute or emergency travel changes, lost luggage tracking, pre-trip travel advice, and more. AIG Travel Guard is a wholly owned subsidiary of AIG Travel, Inc., a member company of American International Group, Inc. (AIG). American International Group, Inc. (AIG), a world leader in insurance and financial services, is the leading international insurance organization with operations in more than 130 countries and jurisdictions. AIG companies serve commercial, institutional and individual customers through the most extensive worldwide property-casualty and life insurance networks of any insurer. In addition, AIG companies are leading providers of retirement services, financial services and asset management around the world. AIG’s common stock is listed on the New York Stock Exchange, as well as the stock exchanges in Ireland and Tokyo. Insurance is underwritten by National Union Fire Insurance Company of Pittsburgh, Pa, a subsidiary of American International Group, Inc., with its principal place of business in New York, NY, currently authorized to transact business in all states and the District of Columbia. The Policy will contain reductions, limitations, exclusions, and termination provisions. All coverages may not be available in all states.